This IBM Redbooks publication provides a basic introduction to IBM DB2 Content Manager Version 8 eClient. 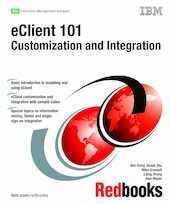 By providing helpful, easy-to-understand sample codes and step-by-step instructions, this book will help you in your next eClient integration and customization project. We provide detailed step-by-step instructions on installing eClient, installing eClient in a WebSphere Network Deployment environment, and using eClient. To prepare for eClient customization and integration, we introduce J2EE, servlets, and JSPs. We cover the eClient architecture and inspect a basic eClient control flow. We also provide the essential information required to start creating applications with EIP. We include sample codes to demonstrate the usages of APIs. In addition, we provide step-by-step instructions on setting up an eClient development environment and discuss design and implementation considerations. We provide sample codes for changing the look and feel, customizing the edit attributes window, adding customized functions in the search results window, and using EIP privileges for access control. By demonstrating some of the customization with the sample codes, you should have a better understanding of what and how you can customize eClient for your business needs. We cover e-mail integration and special topics on Information Mining Service, Siebel integration, and single sign-on integration. The installation, setup, configuration, and integration are presented with detailed step-by-step instructions. We provide detailed sample codes for enabling metadata-based data retrieval. Finally, we provide tips and recommendations on how to troubleshoot problems, with a list of typical problems and their resolutions. In addition, we give a brief introduction to performance tuning for eClient.